This bag is handmade from vegetable tanned leather and utility hide. 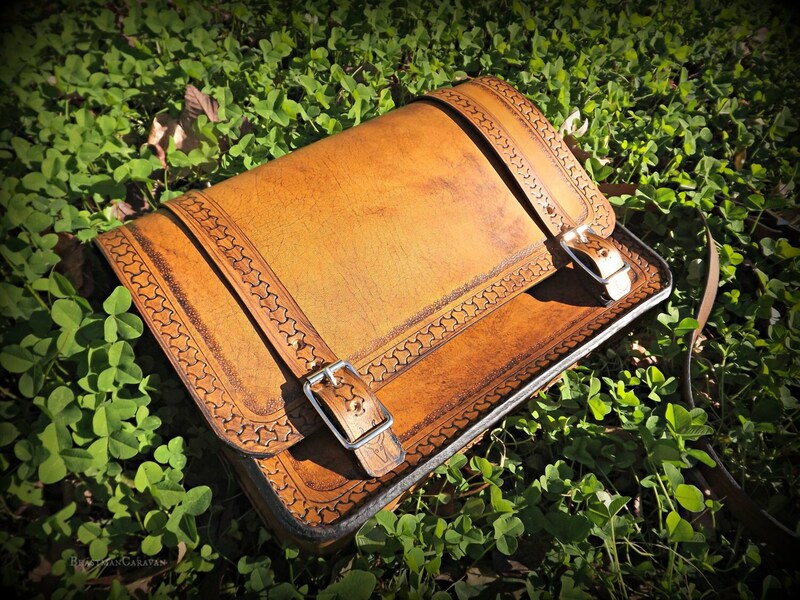 The bag features a handtooled leather border and is made to last. The bag is big enough to fit your day to day items and is made to order. 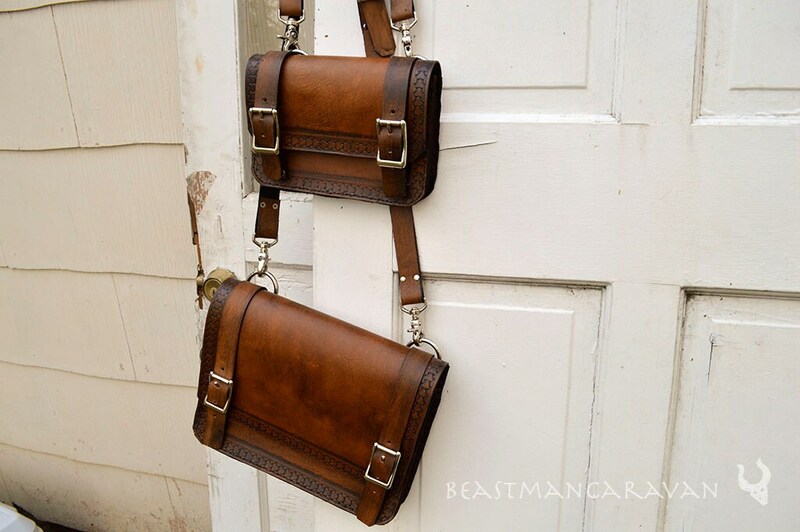 If you would like a custom design on this bag, let me know and I will create a custom order! The bag is available in three sizes as well as any custom size you need. Please message me for a custom bag. Every product is made the hard way, completely by hand. I start out with natural, vegetable tanned leather in the optimal thickness for the product. The leather is cut by hand into all the necessary components to complete the product. Then, I do all the edges and tooling by hand using traditional tools and techniques. Next, I utilize eco-friendly dyes to paint, dye, and antique each piece before sewing and assembling the final product by hand. The product is completely hand-stitched with heavy-duty waxed linen thread and double stitched to maintain the structural integrity of the product for years and years to come. Each of these products is made to last a very, very long time. I aim to make things that can and will be passed down to future generations. Each item is crafted to be sturdy, rugged, and durable so that it will be able to join and assist you in many adventures to come. 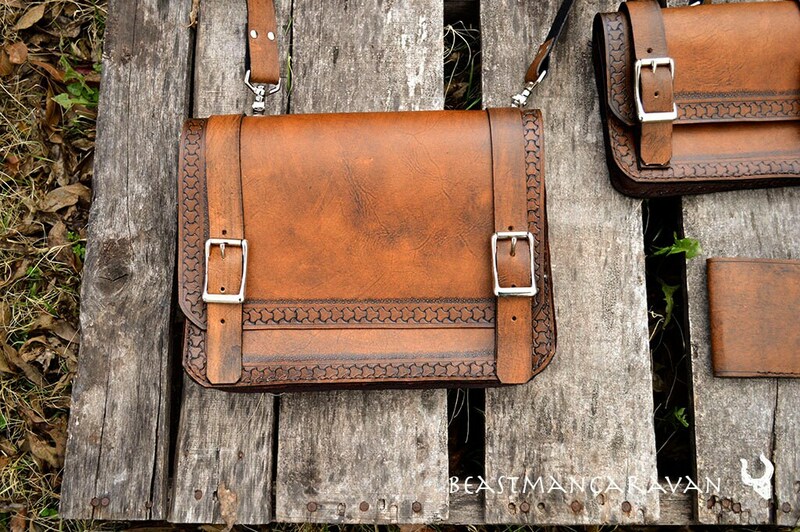 As every piece of leather is unique and each product is hand made to order, there will never be two identical products! If you like what you see, but nothing quite suits your desires, please let me know what you would like to have made and I will do a custom order for you. Whether it is a simple personalization with your name or initials, a custom design on an existing product, or an entirely new product, I would be happy to collaborate with you to ensure you get something that meets and exceeds your expectations. I hope you have enjoyed looking at the items in my shop and have a great day!